Investor concern that mounting costs could weigh on financial results caused a retreat ahead of third-quarter earnings. In the wake of launching its Parkinson's disease drug -- Nuplazid -- on its own, and ahead of third-quarter financial results, ACADIA Pharmaceuticals, Inc. (NASDAQ:ACAD) shares tumbled 26.7% last month, according to S&P Global Market Intelligence. Nuplazid is the first FDA-approved therapy for Parkinson's disease psychosis (PDP) and after deciding to retain the rights to the drug, ACADIA Pharmaceuticals launched it in May. The company raised $500 million this year via dilutive stock offerings to finance Nuplazid's roll-out. Those capital raises were necessary because the company's operating expenses are soaring. 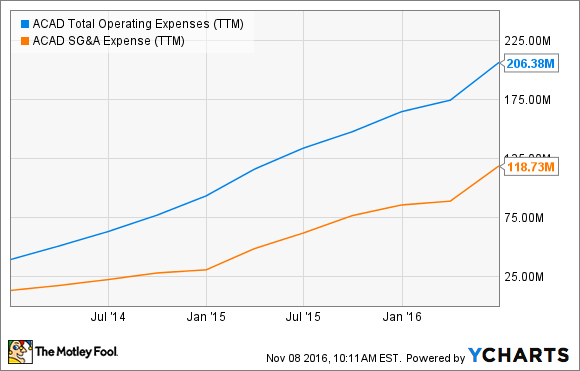 Operating costs were $72 million in Q2, up from $39 million last year, and in Q3, they climbed to $77 million from $39 million a year ago. Selling, general, and administrative costs more than doubled year over year to $50.5 million in Q3 from $20.3 million. ACAD Total Operating Expenses (TTM) data by YCharts. So far, Nuplazid's sales aren't offsetting very much of that spending. The company reported sales of $5.3 million in Q3, and as a result, ACADIA Pharmaceuticals lost $71.6 million in the period. Through the first nine months of 2016, the company lost $192.7 million. For comparison, ACADIA Pharmaceuticals' net loss in Q3 2015 was $38.9 million, and its loss through the first nine months of 2015 was $118.7 million. ACADIA Pharmaceuticals' management says Nuplazid demand is building, and the potential addressable market for Nuplazid is huge, so there are reasons investors ought to keep tabs on this company's stock. There are about 1 million Americans with Parkinson's disease, and roughly 40% suffer from PDP. Because there are no other FDA approved treatments, tapping into this patient population could make Nuplazid a top seller. Nuplazid's potential could be even bigger if studies in Alzheimer's disease and schizophrenia pan out. ACADIA Pharmaceuticals plans to report findings from a phase 2 study of Nuplazid in Alzheimer's disease psychosis later this quarter. There are about 5 million people with Alzheimer's disease in the United States, and over 25% of these patients suffer from psychosis. A phase 3 study in Alzheimer's disease agitation is also on deck to begin soon. Nuplazid's may offer a new option for patients with schizophrenia as well, because up to 30% of schizophrenia patients have an inadequate response to existing therapies. A phase 3 trial of Nuplazid as an adjunct schizophrenia treatment is planned. Overall, ACADIA Pharmaceuticals' spending means there's no clarity into when this company could turn profitable, but Nuplazid is an intriguing drug with a big market opportunity. Therefore, this company should be viewed as a high-risk, high-reward play.